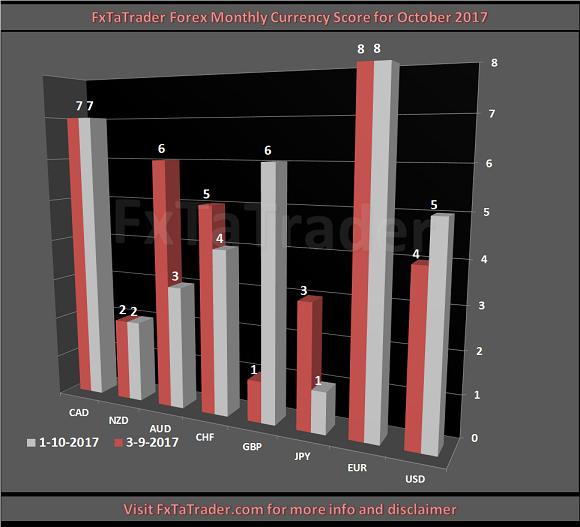 The Top 10 of the Ranking and Rating list for the coming month shows the following stronger currencies being well represented for going long: the EUR(4X) with the CAD(4X). The weaker currencies are the JPY(4X) followed by the NZD(2X) and the AUD(2X). The Chart for this month is the AUD/JPY Daily chart. Price is clearly in an uptrend and made a high lately at 90,30. It is now consolidating below that level and around the Kijun-Sen. It may continue to consolidate in the coming period. A nice buy opportunity would be around the current level and the Kijun-Sen. By preference the candlesticks should show a good pattern that confirms the entry. This could be the Engulfing pattern, Morningstar etc. etc. Check e.g. 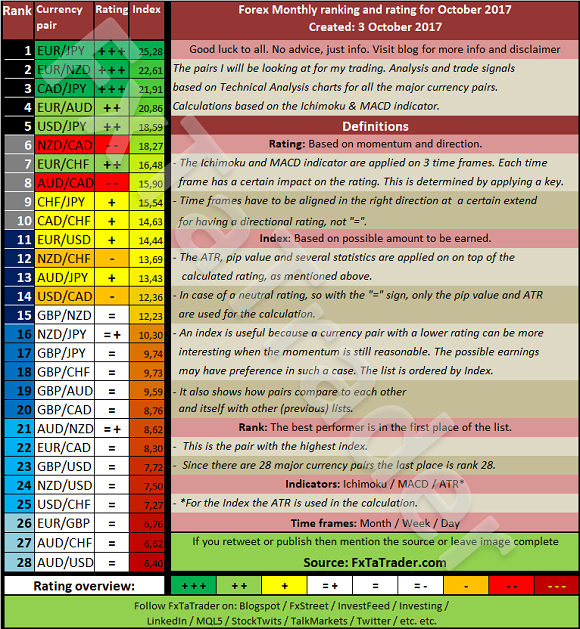 the following link for more information: Bulkowski's Top 10 Reversal Candlesticks. The target should be below the latest recent high at 90,30. The AUD is a strong currency and the JPY a Weak currency. The Currency Score Difference is 2.